Strasburg’s hero… his Superman… his Spiderman… his BATman… missed the bat signal on Wednesday night. Adam Dunn goes 2 for 4 but fails to drive in a Strasburg saving RBI. OK, I’ll be honest. I haven’t seen every Strasburg pitch, but I’ve made sure I’ve seen at least 1 Strasburg pitch in his first 4 games. I have, however, made sure to watch, gamecast (Thank You Al Gore for the internet), or receive texts (4-INFO is the greatest free mobile alert system available) of every Strasburg inning. If you still don’t think he is the second coming of “The Ryan Express“, you need to double check his remarkable stats. This is the guy who had 14K and 0BB AND 0 fly ball outs in his MLB debut. This is the guy who had 32K in his first 3 major league starts (new MLB record). This is the guy who has only allowed 5BB through 4 games (all in one game). One can argue his opponents have been a bit week (Pit, Clev, Chi Sox, and KC), but to have the command to only walk 5 is remarkable. However, Strasburg (before tonight’s game) was 2-0 in 3 starts; and most would like to credit his amazing 100mph fastball. Some would like to credit his un-hittable change-up. What I would like to credit it to is his modern day superhero… Adam Dunn. Strasburg was all the hype the past 2 months of the MLB season and he sold out the Washington ballpark quicker than any other name has before. He was lights out with 14K’s (striking out 8 of the last 9 batters faced), 0 walks, and 0 flyball outs (the most remarkable, I believe). But he still would have gotten the loss if it weren’t for his damsel in distress call to Adam Dunn in the bottom of the 6th. With no one out, one guy on, and trailing by 1 run, Adam Dunn came to the plate. He took his typical mighty cut and connected. Crack! Hello 2-run home run (which I still believe was partially scripted) and the lead for “The S.S Burger”, the National’s Battleship (he has no nickname yet, so I will try to coin mine… it’s either that or the “Ice-Berg”, sinking Titanic teams since 2010). Eventually, the Nationals offense picked up and built a cushion for the rookie phenom. Strasburg would eventually take the win in his Major League Debut with a final score of 5-2. No one could have expected the same output in game 2 as Strasburg had in game 1, but his performance was still outstanding from the mound (despite the Cleveland Indian grounds crew’s best effort). 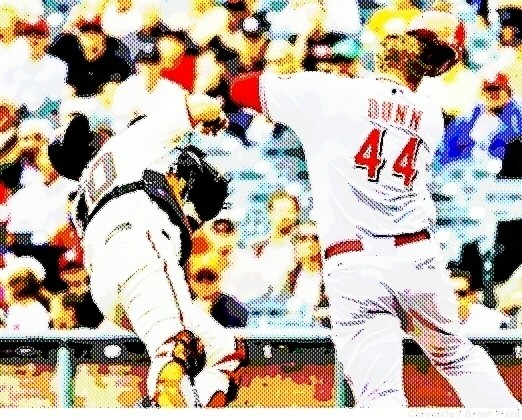 Again Adam Dunn came to Strasburg’s calling. In the 2nd inning, Dunn led off with a double and later scored to give the Nationals a short 1-0 lead (the Indians tied it in the bottom of the 2nd). In the 4th, Dunn smacked a solo homer to give the Nationals the lead for good; and even added to the score in the 6th with a 2-out walk which he later scored on. Final score, 9-4 in favor of “The S.S. Burger” for his second win. Strasburg was back to his original game play, striking out double digits (10K) and walking no one. He gave up a run in the top of the 1st thanks to a speedy Juan Pierre beating out a throw from BATman (aka Dunn) to Strasburg covering first. After that, Stras settled in and delivered his electrifying performance. After Strasburg got the call to hit the showers in the top of the 7th, once again Adam Dunn stepped in to take care of Strasburg’s problems. Trailing by a run with 2 outs and Zimmerman on first in the bottom of the 7th, Dunn roped a double to left-center driving in a run. That’s all the offense the Nationals could muster, but that’s all Strasburg needed. 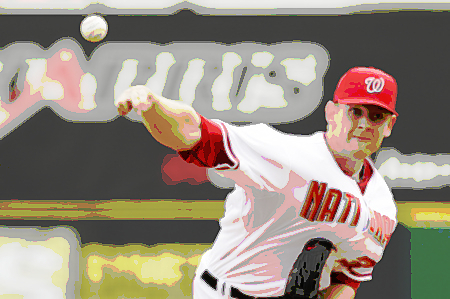 Dunn got him off the hook and Strasburg took the No Decision in his third game in a 2-1 loss for the Nationals. Strasburg’s 4th start was against the Royals at the Nation’s capital… just 4 hours southwest of the usual place you find heroes lurking in the shadows; except this time, Adam Dunn wasn’t one of them. Strasburg came out firing by striking out Scotty Pods who was the first victim of the S.S. Burger and Strasburg continued to dominate the mound. Dunn tried to rally the offense in the 2nd by hitting a lead off single, but he ended up being stranded. In the top of the 4th, the Royals delivered a blow back by scoring one run with two outs. In the bottom of the 4th, Dunn hit a deep fly to left to end the inning leaving the score 0-1. In his next at-bat, Dunn came up in the 6th with two men on and one out. He drove a single to right field and Bernadina got the wave around third. But Jose Guillen wasn’t going to allow Dunn to save Strasburg a 4th time; and he threw a laser to home. Bernadina was called out at the plate. In the bottom of the 9th, Dunn had one last chance to answer the BAT signal in the evening DC sky. Leading the inning off, Dunn failed to get the ball out of the infield. Leaving the final score 0-1, Dunn eventually disappeared into the shadows of the home team lockers ignoring Strasburg’s distress signal. The current score… Strasburg 2, evil villains 1. The next epic battle begins Tuesday June 29 at 6:10pm Central time (may be bumped up to June 28).